The Ottawa Senators may be tied 1-1 with the Pittsburgh Penguins in the Eastern Conference Final, but the shot totals tell a different story. On one hand, things look okay for the Senators. They’ve only allowed two Pittsburgh goals in two games. On the other hand, one goal was all it took to seize the win in Game Two. And the Senators have also only scored two goals, none of which came in Game Two. What’s more, Ottawa went almost 19 minutes on Monday without generating a shot. 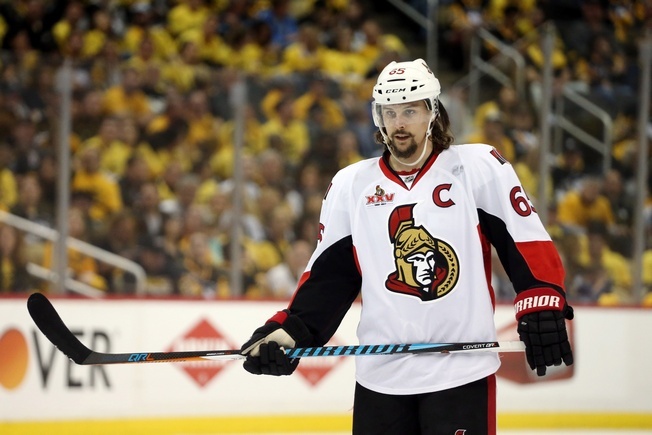 In the first two rounds, the Senators came up with 34 goals in a dozen games. But the Penguins dominated the puck possession game in Game Two and will build on that as the series swings to the Canadian Tire Centre on Wednesday night. If the Senators don’t respond by applying more pressure and getting in Marc-Andre Fleury’s kitchen, they could find themselves in trouble. Ottawa’s tenacity in the neutral zone has been their meal ticket through much of the year and they’ve been able to build on limiting the speed of their opponents, but Pittsburgh can play an aggressive game down the middle. When the Senators chipped the puck in and waited for the Penguins to make a mistake in Game Two, the Penguins pounced and regrouped. So what’s the answer? Pressure. Now, controlling the play is obviously an uphill climb against a top-tier team like the Penguins. And the Senators can’t just decide not to turn the puck over. But they can adjust and that’s something to look for on Wednesday. The neutral zone play will tighten as Ottawa looks to better calibrate against the rush. After all, Phil Kessel scored Pittsburgh’s lone Game Two goal on the rush (off a blocked shot, no less) and you can bet the Senators wanted that one back. And then there’s the simpler but no less astute approach to what went down on Monday.